Peridotite xenolith from San Carlos, southwestern United States. The rock is typical olivine-rich peridotite, cut by a centimeter-thick layer of greenish-black pyroxenite. Peridotite is a dense, coarse-grained igneous rock, consisting mostly of the minerals olivine and pyroxene. This rock is derived from the Earth's mantle. Its composition varies, depending on the mineral content of the rock. Generally, it is rich in magnesium, with appreciable amounts of iron, and less than 45 percent silica. It is therefore described as ultramafic or ultrabasic. The composition of some peridotite nodules offer insights into the materials and processes that were involved in Earth's early history. Peridotite is also sought for its economic value. Some of the rock is mined for the ornamental stone known as peridot, which is gem-quality olivine. The sulfide ores of nickel and platinum and the chromite form of chromium are often found associated with peridotite. When hydrated at low temperatures, peridotite forms become serpentine, which may include chrysotile asbestos and talc. 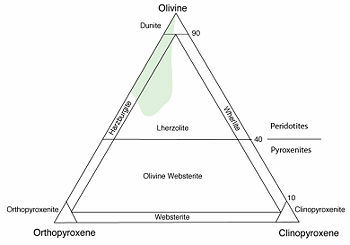 Classification diagram for peridotite and pyroxenite, based on proportions of olivine and pyroxene. The pale green area encompasses the most common compositions of peridotite in the upper part of the Earth's mantle (partly adapted from Bodinier and Godard (2004)). Peridotite is the dominant rock of the upper part of Earth's mantle. It is obtained either in the form of solid blocks and fragments or crystals accumulated from magmas formed in the mantle. The compositions of peridotite nodules found in certain basalts and diamond pipes (kimberlites) are of special interest because they provide samples of the mantle roots of continents, brought up from depths ranging from about 30 kilometers (km) to 200 km or more. Some of the nodules preserve isotope ratios of osmium and other elements that record processes over three billion years ago. Thus, they provide clues to the composition of Earth's early mantle and the complexities of the processes that took place. Consequently, they are of special interest to paleogeologists. Dunite: Consists of more than 90 percent olivine, typically with a magnesium-to-iron ratio of about 9:1. Harzburgite: Composed mostly of olivine plus orthopyroxene, and relatively low proportions of basaltic ingredients (Garnet and clinopyroxene are minor ingredients). Wehrlite: Composed mostly of olivine plus clinopyroxene. Lherzolite: Composed mostly of olivine, orthopyroxene (commonly enstatite), and clinopyroxene (diopside), and have relatively high proportions of basaltic ingredients (garnet and clinopyroxene). Partial fusion of lherzolite and extraction of the melt fraction can leave a solid residue of harzburgite. Peridotites are rich in magnesium, reflecting the high proportions of magnesium-rich olivine. The compositions of peridotites from layered igneous complexes vary widely, reflecting the relative proportions of pyroxenes, chromite, plagioclase, and amphibole. Minor minerals and mineral groups in peridotite include plagioclase, spinel (commonly the mineral chromite), garnet (especially the mineral pyrope), amphibole, and phlogopite. In peridotite, plagioclase is stable at relatively low pressures (crustal depths), aluminous spinel at higher pressures (to depths of 60 km or so), and garnet at yet higher pressures. Pyroxenites are related ultramafic rocks, which are composed largely of orthopyroxene and/or clinopyroxene; minerals that may be present in lesser abundance include olivine, garnet, plagioclase, amphibole, and spinel. It is thought that peridotites originated by two primary modes: (a) As mantle rocks formed during the accretion and differentiation of the Earth; or (b) as cumulate rocks formed by the precipitation of olivine and pyroxenes from basaltic or ultramafic magmas. These magmas are ultimately derived from the upper mantle by partial melting of mantle peridotites. Peridotite is the dominant rock of the Earth's mantle above a depth of about 400 km. 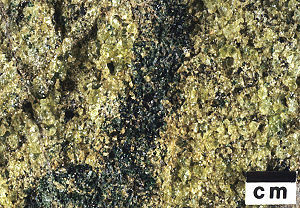 Below that depth, olivine is converted to a higher-pressure mineral. Oceanic plates consist of up to about 100 km of peridotite covered by a thin crust. This crust, commonly about 6 km thick, consists of basalt, gabbro, and minor sediments. The peridotite below the ocean crust, "abyssal peridotite," is found on the walls of rifts in the deep sea floor. Oceanic plates are usually subducted back into the mantle in subduction zones. However, some pieces can be emplaced into or thrust over continental crust by a process called obduction, rather than carried down into the mantle. The emplacement may occur during orogenies (mountain formation), as during collisions of one continent with another or with an island arc. The pieces of oceanic plates emplaced within continental crust are referred to as ophiolites. Typical ophiolites consist mostly of peridotite with associated rocks such as gabbro, pillow basalt, diabase sill-and-dike complexes, and red chert. Other masses of peridotite have been emplaced into mountain belts as solid masses but do not appear to be related to ophiolites, and they have been called "orogenic peridotite massifs" and "alpine peridotites." Peridotites also occur as fragments (xenoliths—a rock fragment that becomes enveloped in a larger rock when the latter rock develops and hardens) carried up by magmas from the mantle. Among the rocks that commonly include peridotite xenoliths are basalt and kimberlite. Certain volcanic rocks, sometimes called komatiites, are so rich in olivine and pyroxene that they also can be termed peridotite. Small pieces of peridotite have even been found in lunar breccias. The rocks of the peridotite family are uncommon at the surface and are highly unstable, because olivine reacts quickly with water at typical temperatures of the upper crust and at the Earth's surface. Many, if not most, surface outcrops have been at least partly altered to serpentinite, a process by which the pyroxenes and olivines are converted to green serpentine. This hydration reaction involves considerable increase in volume with concurrent deformation of the original textures. Serpentinites are mechanically weak and so flow readily within the earth. Distinctive plant communities grow in soils developed on serpentinite, because of the unusual composition of the underlying rock. One mineral in the serpentine group, chrysotile, is a type of asbestos. Some peridotites are layered or are themselves layers; others are massive. Many layered peridotites occur near the base of bodies of stratified gabbroic complexes. Other layered peridotites occur isolated, but possibly once composed part of major gabbroic complexes. Well-formed crystals of olivine separated by other minerals. This probably reflects the original deposition of olivine sediment from magma. Equigranular crystals with straight grain boundaries intersecting at about 120°. This may result from slow cooling whereby recrystallization leads to a minimization of surface energy. Long crystals with ragged curvilinear boundaries. This probably results from internal deformation. Many peridotite occurrences have characteristic textures. For example, peridotites with well-formed olivine crystals occur mainly as layers in gabbroic complexes. "Alpine" peridotites generally have irregular crystals that occur as more or less serpentinized lenses bounded by faults in belts of folded mountains such as the Alpine regions, the Pacific coast ranges, and in the Appalachian piedmont. Peridotite nodules with irregular equigranular textures are often found in alkaline basalts and in kimberlite pipes. Some peridotites rich in amphibole have a concentric layered structure and form parts of plutons called Alaskan-type zoned ultramafic complexes. Komatiites are the rare volcanic equivalent of peridotite. Eclogite, a rock similar to basalt in composition, is composed primarily of sodic clinopyroxene and garnet. Eclogite is associated with peridotite in some xenoliths and in rocks metamorphosed at high pressures during processes related to subduction. Peridotite is named for the gemstone peridot, a glassy green gem mined in Asia and Arizona (Peridot Cove). Some peridotite is mined for ornamental stone. Peridotite that has been hydrated at low temperatures forms serpentine, which may include chrysotile asbestos (a form of serpentine) and talc. Layered intrusions with cumulate peridotite are typically associated with sulfide or chromite ores. Sulfides associated with peridotites form nickel ores and platinoid metals. Most of the platinum used in the world today is mined from the Bushveld Igneous Complex in South Africa and the Great Dyke of Zimbabwe. Chromite bands commonly associated with peridotites are the world's major ores of chromium. Blatt, Harvey, and Robert J. Tracy. 1995. Petrology: Igneous, Sedimentary, and Metamorphic, 2nd edition. New York: W.H. Freeman. ISBN 0716724383. Bodinier, J.-L., and M. Godard. 2004. "Orogenic, Ophiolitic, and Abyssal Peridotites." In The Mantle and Core. Edited by R.W. Carson. Amsterdam: Elsevier Pergamon. ISBN 0080437516. Farndon, John. 2006. The Practical Encyclopedia of Rocks & Minerals: How to Find, Identify, Collect and Maintain the World's best Specimens, with over 1000 Photographs and Artworks. London: Lorenz Books. ISBN 0754815412. McBirney, Alexander R. 2006. Igneous Petrology, 3rd edition. Jones & Bartlett. ISBN 0763734489. Pellant, Chris. 2002. Rocks and Minerals. New York: Dorling Kindersley. ISBN 0789491060. Shaffer, Paul R., Herbert S. Zim, and Raymond Perlman. 2001. Rocks, Gems and Minerals. New York: St. Martin's Press. ISBN 1582381321. This page was last modified on 8 February 2019, at 01:08.